As we approach the cold this year at full force, now more than ever it’s time to look at making sure you have a good heating solution in place. So this week, I will be running a series of articles on wood stoves, pellet stoves and related alternative heat sources. 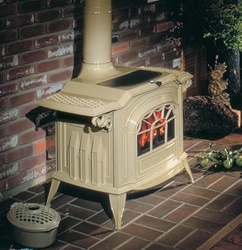 The first stove on our list is the Hearthstone Heritage Wood Stove. Designed for either primary or secondary living room heating, the Hearthstone Heritage Wood Stove provides its owners with the following benefits and features of this fantastic American made wood stove. – Eligible for 2009-2010 federal tax credit in the U.S. So if using a wood stove in your living room is something you’re considering this winter, then going with a Hearthstone Heritage Wood Stove might be a good match for you. Considering the provided eco-friendly technology offered by this line of wood stoves, it seems clear to me that even if it serves as a supplementary method of heating your home, owning the Hearthstone Heritage Wood Stove just a wise investment for your home.